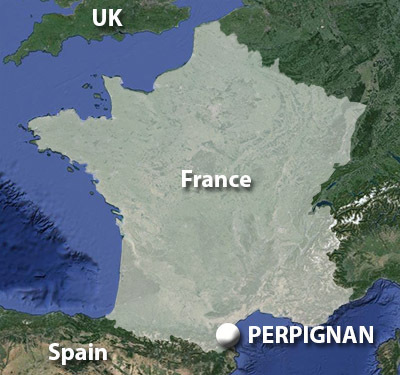 The city of Perpignan was probably a Roman settlement, but was officially founded as a city in the early 10th century. It became the capital of the mainland states of the Kingdom of Majorca, when that kingdom was founded in 1276 (the Kingdom of Majorca consisted of a few islands in the Mediterranean and some disjointed parcels of land in what is now southeastern France and northeastern Spain). Located where the River Têt meets the River Basse, Perpignan built its first city wall in the early 12th century. This wall was only built to protect the core of the town, however: The Count's castle and an old church. The rest of Perpignan existed outside the wall...which didn't make it much of a city wall! 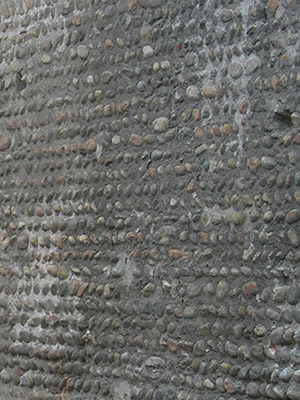 The rest of the city was finally protected with its own wall starting in 1277. The full city wall had 13 doors and, eventually, 70 defensive towers. It was built mostly of mortar, but with small stones from the Têt worked therein, in what seems to be an almost decorative fashion. Improvements were made to the walls over the following few hundred years, including more fortified gateways and the Castillet, an impressive defensive tower, which was built from 1367 to 1370. All of this is very well and good, in that city walls are vaguely pleasing in their own way, but Perpignan's defenses had yet to achieve starfort status, which is the only status that really matters. Fortunately for Perpignan, it had become part of Holy Roman Emperor Charles V (1500-1558)'s domains by the middle of the 16th century. Charles decreed that a bastioned trace be built around the city's original castle, and Perpignan had its starfort! Unfortunately it wasn't a very good starfort. The bastions were of vastly differing sizes, and thus didn't effectively provide flanking fire for the fort's walls. The southern side of the fort was unbastioned, with only a kind of lazy V shape, which may have made sense in that it was already somewhat protected by the city's walls, but...if you're building a starfort, Charles, you need a starfort, not a partial puss of a starfort. Happily, Phillip II of Spain (1527-1598) had his fortification act together. 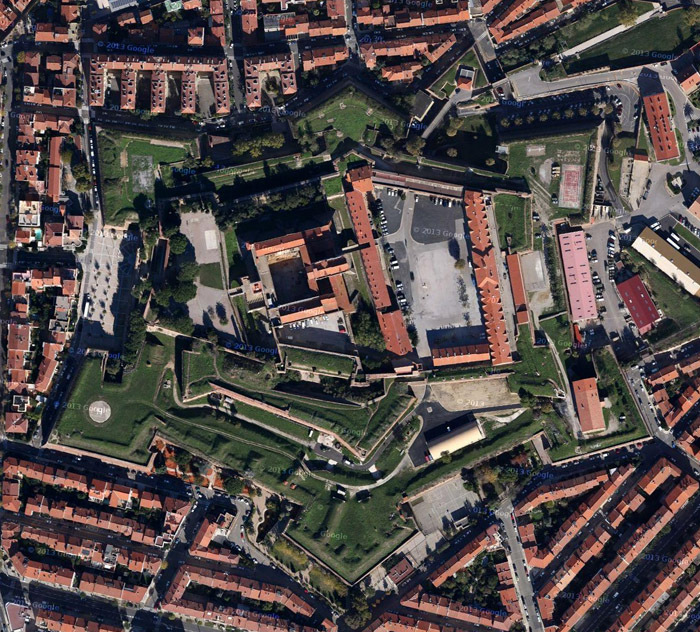 He had the proper starfort that we see today built around the weird attempts of Charles V (one can still the earlier starfort attempts within the newer walls), in 1590. The starfort portion of the city's defenses became known as le Citadelle. Improvements were also made on the city walls by the end of the 16th century, including bastions and the general pointiness of the age. During the 30 Years' War (1618-1648) Catalonia rebelled against Spain, leading to the army of French King Louis XIII (1601-1643) besieging Perpignan in September of 1642. 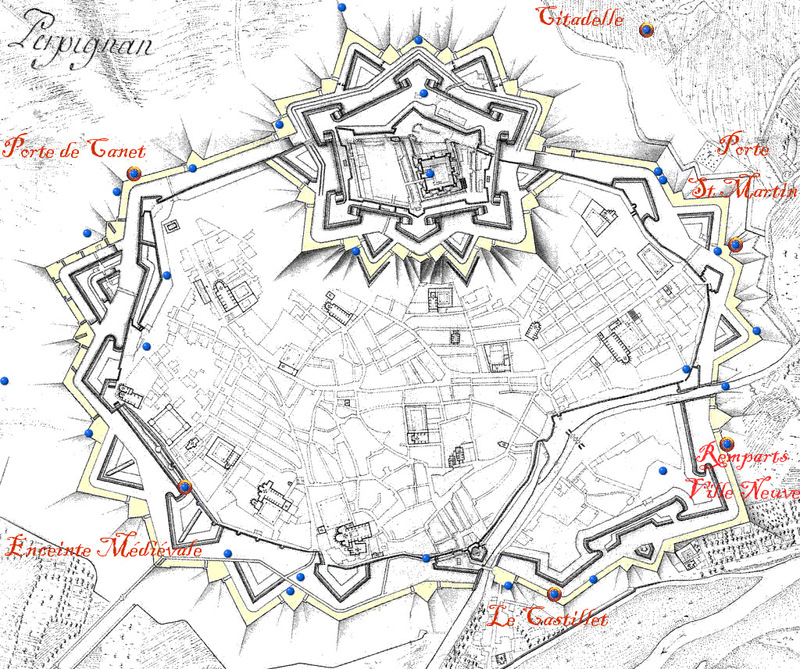 Whatever part les Remparts and specifically the Citadelle played in this siege went unremarked, but Perpignan became, at least unofficially, part of France by the end of 1642. In 1659 Spain formally ceded the region to France with the Treaty of the Pyrenees. And when you're part of France in the 17th century, you're blessed with the magical touch of Vauban. Sébastien Le Prestre de Vauban (1633-1707) was France's preeminent military engineer, and is known today as the Father of the Starfort. Les Remparts in the 17th century, after Vauban's work. Watch it with the overuse of those popular fonts, Mr. Mapmaker. Calling him the father of the starfort may not be completely accurate, as Vauban came along when the starfort revolution had been under way for well over a century, but his innovations in the field of starfortery, plus the sheer scale of his work (over 40 years at the end of the 17th & beginning of the 18th centuries, dude built and/or improved the fortifications of around 300 cities), definitely make him a legend amongst the starry-eyed legions of starfort admirers. One of Vauban's additions to the Citadelle: The Ravelin! 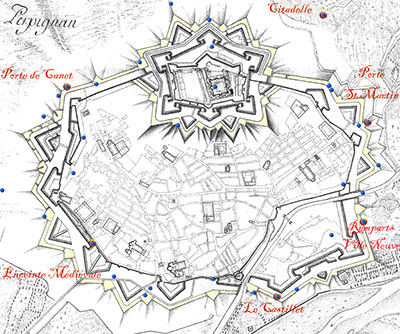 In addition to some buildings inside the fort, Vauban added six demilunes around the Citadelle, including its Ravelin. These new additions necessitated the destruction of several homes outside the fort, so Vauban also designed a new suburb, Ville Neuve, on the other side of the River Basse. This suburb was protected by two new bastions. Vauban also built a covered way to protect those moving from defensive point to point along the city's walls, which he also strengthened. All of this striking Vaubannery had the desired effect, and nobody every messed with Perpignan again - although this likely had as much to do with France's improved relations with Spain going into the 18th century, as the lands to the north of France became more threatening. By the middle of the 19th century, the ever-growing Perpignan, 3/5 of which was now outside the city's walls, began to wish those pesky Remparts were no more. 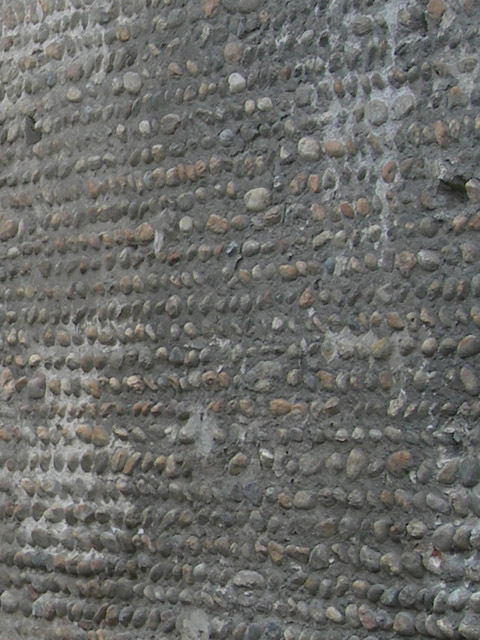 Les Remparts were owned by the military, however, which still insisted that the walls were necessary for the city's defense, all evidence to the contrary. The arrival of the railroad increased the city's population even more, and in 1892 the Committee of Demolition of Walls (which sounds better in French) was formed. This Committee, interested in the city's expansion and not historic preservation, finally managed to buy the city's defenses from the government in 1904. By 1906 most of Les Remparts were gone, save for the Castillet, Notre Dame Gate and Citadelle. Carcassonne, France, to Perpignan's northwest: One of very few French cities whose medieval walls escaped the urban expansion of the 18th century. 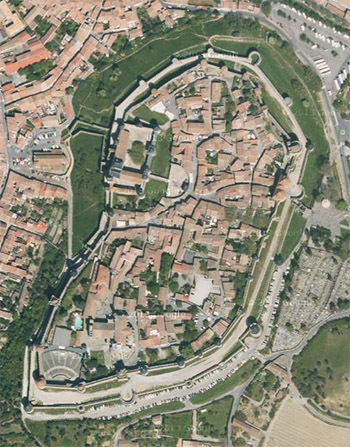 The French government stubbornly refused to let go of the southern portion of les Remparts (perhaps still hoping for a smidgen of protection against an imagined Spanish incursion? 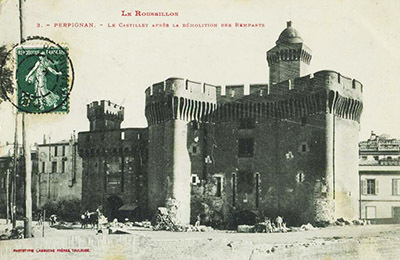 ), but finally agreed to sell the rest of the city walls to Perpignan in 1930. The city happily destroyed what was left. G'bye, 800-year-old historically important artifacts. Today only two of Vauban's demilunes remain. As half of le Citadelle is owned by the military, it is off limits to visitors, but the Palace of the Kings of Majorca, which is the portion enclosed by Charles V's 1540 fortifications, is accessible. 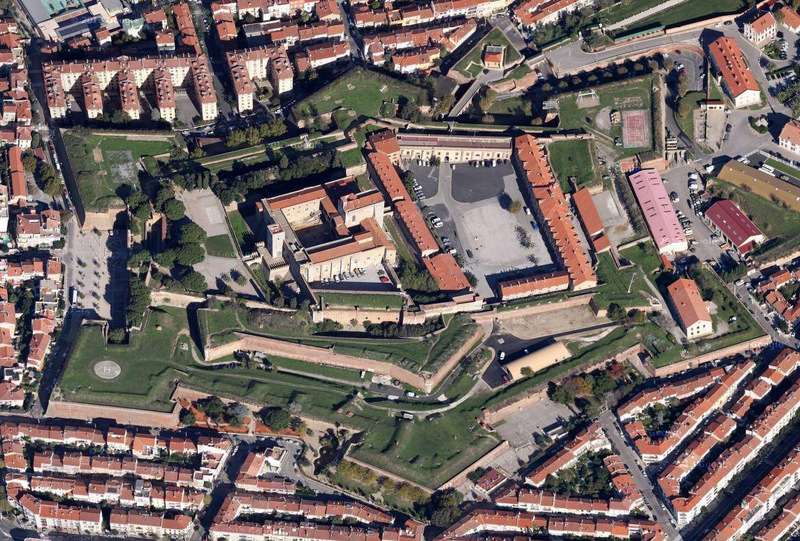 Seen from this angle, one can better pick out le Citadelle's 1540 starfort within the 1590 starfort!